Thousands who attend a Toronto boat show this weekend will have the opportunity to learn about safety on the water from a unique teacher: a common rodent. 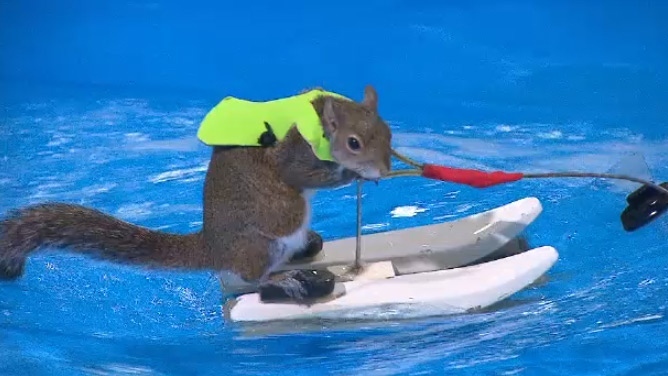 The Toronto International Boat Show brings together million-dollar vessels and the latest in nautical gadgets, but its strangest display is "Twiggy" the waterskiing squirrel. 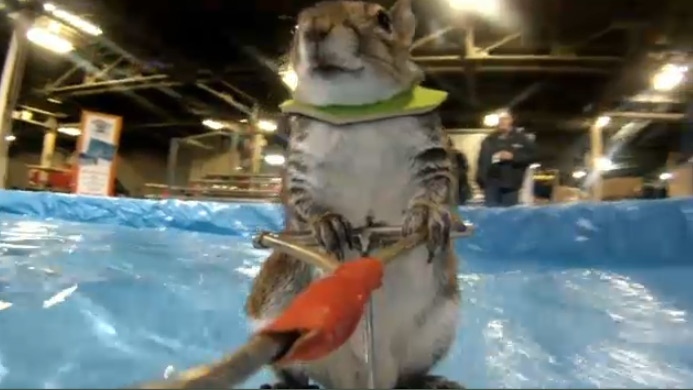 Twiggy commands the crowd’s attention as she skis around an indoor pool, pulled by a squirrel-sized remote-controlled boat. The crowd favourite has been entertaining since 1979, when Lou Ann Best and her husband rescued a squirrel from a storm. Lou Ann's husband, Chuck Best, decided to teach it to waterski with a toy boat. "You're nuts," she told him at the time. More than three decades later, the Bests have done thousands of shows around the world. Like Lassie, there has been more than one Twiggy. The one appearing at this weekend's boat show is the ninth squirrel in a long line of unlikely athletes. The squirrels have appeared in everything from movies to music videos. "They're just like cats. When they want attention, they want it. If they don't, they're going to run off," Lou Ann's son Chuck Best Jr. told CTV Toronto's Scott Lightfoot on Friday. Raised by hand, the squirrels are comfortable being handled by humans. They're also used to being on the water, and the Bests said some squirrels take to skiing naturally. They use the spectacle to teach children about water safety. "There's definitely an entertainment aspect to this show, but there's also an educational angle," Lou Ann said. The message of water safety means a lot to Twiggy's human family. Lou Ann's husband drowned in 1997, as he tried to rescue a family member who didn't know how to swim. Since the drowning, she's outfitted all the squirrels with lifejackets, and uses the show to teach kids. "I love to see the people's faces and I just feel like I'm making a difference in the world," she said. 'Twiggy' waterskis at a Toronto boat show on Friday, Jan. 8, 2016. 'Twiggy' shows off her waterskiing skills in a Toronto pool on Friday, Jan. 8, 2016.